The Paris Opera Ballet (French: Ballet de l'Opéra de Paris) is the oldest national ballet company in the world. Many European and international ballet companies can trace their origins to it. It has always been an integral part of the Paris Opéra, which was founded in 1669 as the Académie d'Opéra (Academy of Opera). Theatrical dance was not an important part of the Paris Opera until 1673. Then was renamed the Académie Royale de Musique (Royal Academy of Music) and placed under the leadership of Jean-Baptiste Lully. The Paris Opera has had many different official names during its long history but since 1994 has been called the Opéra National de Paris (Paris Opera). 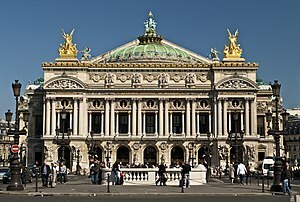 Currently the company presents ballet primarily at the Palais Garnier. ↑ Christout 1998, p. 86. ↑ "Histoire de l'Opéra national de Paris" (in French) at the Paris Opera website. Retrieved 19 July 2011. This page was last changed on 25 November 2016, at 15:14.